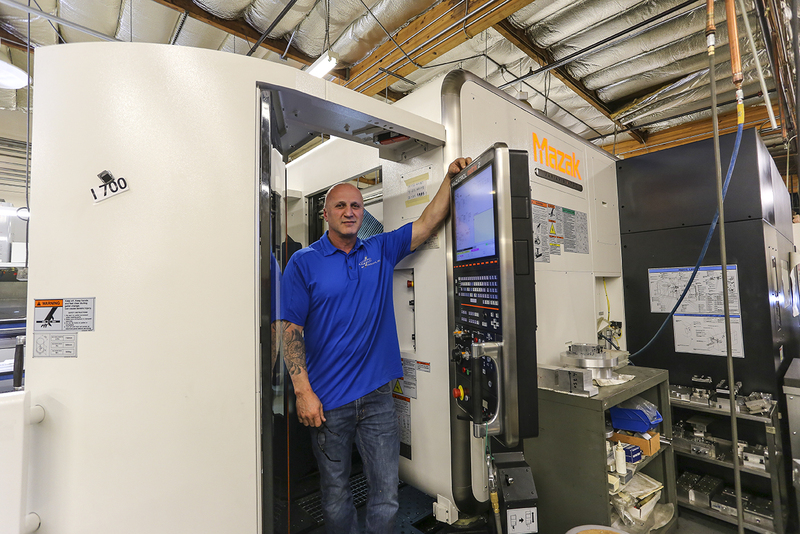 Thriving on Close Tolerance 5-Axis Parts: DP Products Inc.
Danny has been a big supporter of the Mazak brand for a long time. He feels they give the best bang for his buck and likes that they offer every size and type of machine he might need. The uniformed controls that Mazak machines have leads to fewer mistakes made on the shop floor. DP Products’ 17,000 sq.ft. 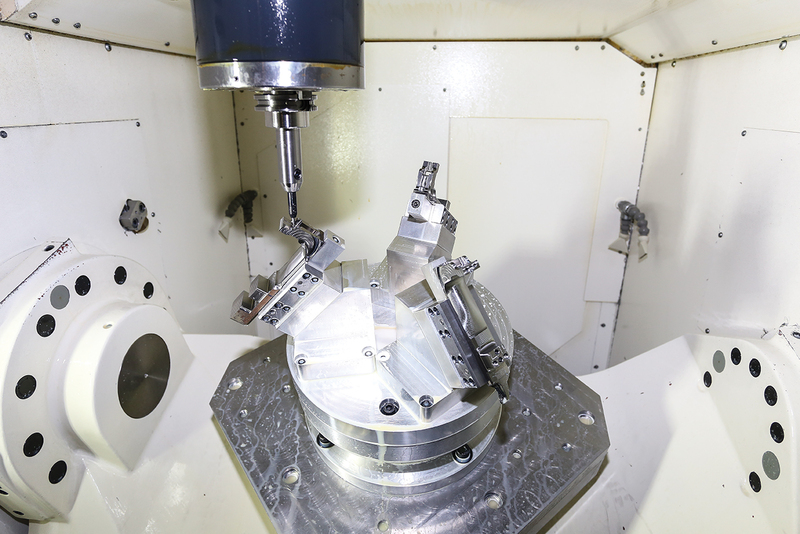 manufacturing facility includes mills, lathes, 5-axis machining centers, grinders, wire EDM, and a state of the art quality lab to support their complex parts made out of exotic materials. DP Products Inc. President and owner, Danny Papadatos, has been in the machining business for 37 years. It started for him at a vocational high school and progressed from there. He “fell into the trade” when he got a job at a local San Jose, CA. machine shop. With an aptitude for machining, he continued his education through various community college programs and hard work. “The first shop I worked in is where I picked up what I call my trade secrets,” describes Danny. “We do things a little differently here at DP Products and those differences are my competitive advantage.” Where most would run a particular job on a mill, Danny and his team might not. His outside the box, can-do thinking is what draws customers from around the world for their short run and prototype needs. Danny realized the old saying of “hard work is rewarded” is very dependent on the people you work for. Over the years he felt like he was being controlled, held back, and stuck inside a box. “I came to this country with my family when I was 7 years old from Greece,” tells Danny. “America is touted as the land of opportunity, but you have to take that opportunity and do something with it. I had engineering friends in the business that encouraged me to undertake side projects for them. For the longest time I didn’t. Then one day I did, and things took off from there.” Danny emptied out his bank accounts; sold everything of value that he owned, and in 1992 opened up a 7,000 sq.ft. shop with two manual mills, two manual lathes, two CNC mills and common tools like grinders, and measuring instruments. “I’ve always worked hard and given everything I had, but it was different doing it for myself. I liked that the lid of the box was open for me.” He hired a sales guy and reinvested everything he made back into DP Products. Soon he was able to work full time for himself, and he has never looked back. DP Products is ISO9000 certified and working towards their AS certification. Most of what they do falls under the label of aerospace and medical but microwave, semi-conductors, and satellite parts also find their way into production. “Complex parts are what we are good at regardless of the industry,” describes Danny. “Providing my employees with the best tools to do their job is a big reason for our success.” Everything from the NX software and Mazak machining centers down to the Mitutoyo CMM with the Renishaw PH20 head are all calculated purchases to streamline the operation and deliver the best possible products. Unlike conventional CMM measurement methods, Renishaw’s 5-axis technology uses synchronized motion of the CMM and the head axes to minimize machine’s dynamic errors at ultra‑high measuring speeds. It is the same technology used on their high end REVO system. On a part with 600+ touch points it saves Ryan an immense amount of time all while adding to the accuracy of his measurements. Like the Parthenon is dedicated to the Greek goddess Athena, Danny pays tribute to the machining deities through precision and accuracy. “Complex 5-axis parts, exotic materials and close tolerances are where we thrive,” concludes Danny. “We are excellent at perfecting our processes and have excellent equipment and know our game. I work hard to educate my employees to be on top of their game. Meeting bare minimum requirements doesn’t fly here at DP Products. The bottom line is, using up the tolerances on the print are only for a worst case scenario. We are calibrated for us to be on, and we stay on. We like to have perfect, high quality parts and our customers demand it.” Word of mouth has always got DP Products work. With no shortage of manufacturing in the area, it is a true testament to their abilities when customers seek them out for complex and challenging parts.